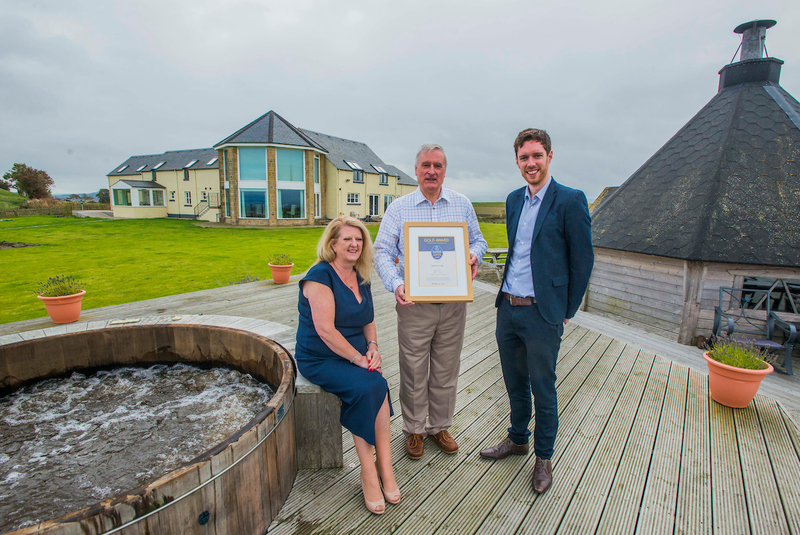 A luxury hotel in East Lothian has achieved a prestigious Quality Assurance award from VisitScotland just one year after opening. Garleton Lodge nestled in a countryside setting between Haddington and Gullane, has been awarded a four-star gold accolade from the national tourism organisation. Having worked in the property and catering industries in the Middle East, Angela and David Cockerton, decided to return to the UK and set up a small hotel offering a careful blend of understated luxury in a homely environment, which includes a restaurant, spa, outdoor hot tub and bar, all with spectacular 360-degree panoramic views across Edinburgh, the Forth and the East Lothian countryside. The Quality Assurance Gold Award shines the spotlight on businesses within the QA Scheme who continue to exceed customer expectations on an on-going basis, whilst taking an innovative and proactive approach in delivering excellence within the tourism industry. Garleton Lodge has also achieved a VisitScotland Taste Our Best Award. The award recognises businesses who are committed to serving and promoting high quality food and drink connecting the places people visit with first-class local produce. Already working very closely with East Lothian food and drink suppliers, Angela and David have plans to open a Cookery School later next year to help further showcase the best of Scottish food and drink. Ahead of this, next month will see the launch of their handmade chocolate business – The Chocolate Stag. Garleton Lodge also work very closely with VisitScotland and East Lothian Council to promote East Lothian as Scotland’s Golf Coast – host to no less than four competitions, the Scottish Open, Scottish Senior Open, Ladies Scottish Open and World Hickory Championship – attracting both international and domestic visitors to stay, play, eat and watch golf. The hotel is also part of the VisitScotland Information Partnership Scheme, giving guests the opportunity to enjoy the luxury and comfort of this accommodation whilst making plans to explore more of what East Lothian has to offer. David Cockerton, Co-owner of Garleton Lodge said: “Angela and I are delighted that VisitScotland has recognized our efforts to provide exceptional guest care, service and hospitality with this Gold Award. January seemed to last forever what with FIVE Mondays and TWO full moons. From 1st February, to celebrate the Year of Young People 2018, Historic Environment Scotland (HES) will be lowering drawbridges and opening gates to young people at historic sites across the country for the low price of £1 when presenting a Young Scot Card. Throughout the month, Preston Lodge High School is having a ban on sugary drinks. Look out for #ProudToBeFizzFree on Twitter. Kitten Kaboodle is offering new customers in East Lothian 10% off their first cat sitting session until 11 Feb (quote “kitten” when you book). Spaces are limited, so contact them now! 1st of February is Time to Talk Day – a chance for all of us to be more open about mental health – to talk, to listen, to change lives. Take a look at the Conversation Starter (pdf). Schools in East Lothian break up for half term on Friday 9th, returning Tuesday 20th. The launch of new Pride for East Lothian takes place at Cockenzie House and Garden, on Saturday, February 17 from 11am – 7pm as part of LGBT History Month. Shepherd House, Inveresk, will be part of The Snowdrop Festival on 24th and 25th February from 11 – 4 pm. It will also be open 13th February – 6th March on Tuesdays & Thursdays from 2-4pm. From 25th February, there will be improvements to East Coast bus services including additional services on the 107 (renumbered as X7) at peak times; the extension of the 106 service to Fort Kinnaird; and the introduction of the N113 NightHawk service to Ormiston. East Coast Buses have put together a Christmas timetable to make sure you can travel around East Lothian as well as to and from Edinburgh this festive season. There will be special services running on Christmas Day, Boxing Day and 1 January and a Saturday service to help you get around on 24, 27, 28, 29, 30 and 31 December (please remember last evening services will depart earlier than normal on 24 and 31 December). Vote for the Pans Labyrinth! This grant will enable the charity to work with international labyrinth artist Jim Buchanan in holding several events in Cuthill Park to design a labyrinth linked to the salt-panning heritage of Prestonpans, and have it installed at the top of our beautiful, sloping park where it will have breathtaking views over the Firth of Forth and bring the benefit of mindful, peaceful, reflective labyrinth walking to our whole community. The group will involve the community in workshops to develop a unique design for the Prestonpans labyrinth under the guidance of experienced labyrinth artist Jim Buchanan. This is an exciting and unusual opportunity for the community to be part of the development of something beautiful, enduring and positive, which they can take pride in for years to come. Several temporary labyrinths will be mown into the grass in the park, a final design will be chosen and installed using hard wearing, low maintenance materials. The labyrinth will address the Area Partnership’s priority to improve wellbeing by providing a permanent space for people to go to experience meditative, peaceful pondering. This reduces a person’s stress levels & helps them to develop resilience. A permanent labyrinth will also provide a focal point for mindfulness events for the community and the varied groups who come to Cuthill Park, from the local Home Educating families, to the nursery, Afterschool Club, DadsWork, and the local schools. Many families bring their children to play in the park, and grandparents, parents and children alike can enjoy walking a labyrinth. Likewise there are hundreds of local dog owners who visit the park regularly and who will have the opportunity to include a peaceful, meditative experience in their daily walk. The nursery and the AfterSchool club both take care of raised beds in the community garden, and feel the addition of a labyrinth to the park will bring another facet to their experience there. DadsWork (a charity supporting fathers) use the park regularly and will benefit from the labyrinth. Di Williams MBE, the UK Master Teacher for Labyrinth Facilitator Training, advised on the best location for the labyrinth, expressing delight over the effect the stunning view will have on those walking the labyrinth. As shown by the many projects we have successfully completed in the park, we are experienced at working in partnership with other organisations and have the necessary experience, enthusiasm and resilience to see this project to completion. We find great fulfilment in providing our community with a rich and diverse range of opportunities and experiences when they visit our much-loved park. The Proposed Strategic Development Plan deals with a range of strategic planning issues including housing, transport and green infrastructure for a twenty year period beginning in 2018. Its role will be to guide Local Development Plans produced by Local Authorities in the future. Comments, known as representations, can be made on the Proposed Strategic Development Plan for a six week period between Thursday 13 October and Thursday 24 November 2016. Representations should be made in writing and submitted using SESplan’s consultation portal: sesplan-consult.objective.co.uk. In line with government guidelines, representations should set out the specific changes you think should be made to the plan along with a justification for such changes. Representations should be limited to 2,000 words per issue, though you are welcome to submit representations on more than one issue. The Proposed Strategic Development Plan can be read and downloaded online at www.sesplan.gov.uk or paper copies can be read at libraries and planning offices within the region. Each event will be open from 3pm to 6.30pm on a drop-in basis when anyone can come along to discuss the plan without prior arrangement. From 6.30pm there will be a presentation and Q&A session. For the presentation sessions spaces may be limited, so please let SESplan know if you are wishing to come along using the contact details below. More information on the Proposed Strategic Development Plan and supporting documents, events and making a representation can be found on the SESplan website www.sesplan.gov.uk. If you would like to contact SESplan about the plan, events or for any other information, you can email contactus@sesplan.gov.uk, call on 01506 282883 or write to them at SESplan, Second Floor, West Lothian Civic Centre, Howden South Road, Livingston EH54 6FF. You’ll soon be able to benefit from two new bus services that will take you home after weekend nights out in Edinburgh. Launching on Saturday 5 November, the new NightHawk services will depart from Frederick Street and end in Dunbar and North Berwick. The routes will also take in stops on Princes Street, Leith Street and the Omni Centre, as well as Musselburgh. NightHawk N106 will run from Edinburgh City Centre via Musselburgh, Tranent, Haddington, East Linton and Dunbar. Two journeys will run on Saturday and Sunday mornings departing the city centre at 0025 & 0225. NightHawk N124 will run from Edinburgh City Centre via Musselburgh, Prestonpans, Longniddry, Gullane and North Berwick. Two journeys will run on Saturday and Sunday mornings departing the city centre at 0055 & 0255. This note was circulated at the RAGES - Rail Action Group East of Scotland AGM. Reston and East Linton stations are within our grasp and we need you to keep up the pressure on your MSP and ultimately the Transport Minister, otherwise we face another 20 years of closed stations and no hope of trains ever returning to Berwickshire and East Lothian. Below is a style of Email or Letter for your MSP. Please send this to at least one of your elected representatives - or to all of them - so that they know that the people of Berwickshire and East Lothian are really in favour of our Stations returning. 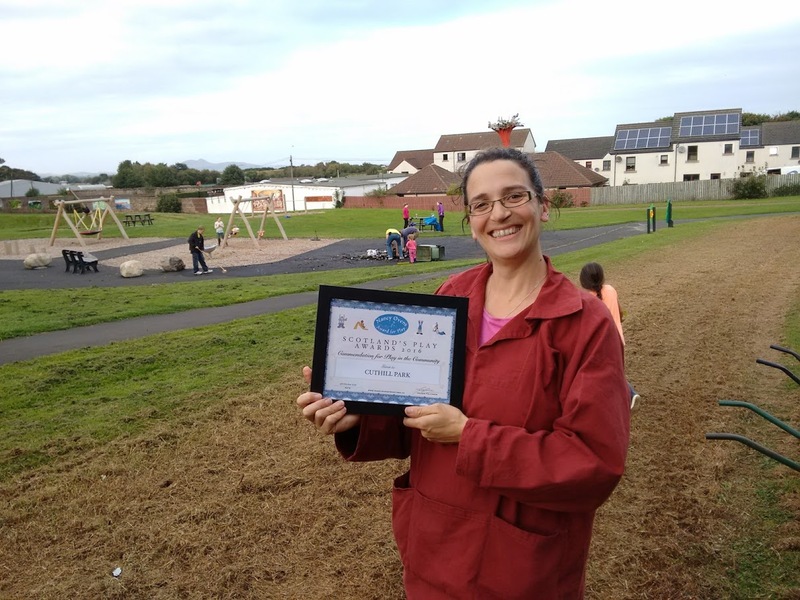 Cuthill Park in Prestonpans, has been honoured at the Nancy Ovens Play Awards, which recognise those who provide or support access to high quality outdoor play experiences for children. The Trustees of the Nancy Ovens Trust commended the park in the Play in the Community category. The accolade was announced at a ceremony on Tuesday 4th October 2016 at Dumfries House, Cumnock, Ayrshire. In 2012, the park had the lowest quality rating of any play park in the East Lothian area. Fearing it may become lost to the community, the Friends of Cuthill Park group sought to safeguard its future and it was given permanent protection from development when it was designated a Queen Elizabeth II Field. Since then, improvements have included the installation of decorative railings in the roadside boundary wall and the annual sowing of wildflower meadows. The biggest change came in 2015 when £87,000 was spent on play equipment in what Jupiter Play described as a ‘challenging‘ project owing to a mixture of ground conditions including undulating grass areas surrounded by sloping hills lined with trees. Since the creation of the play area, Cuthill Park has received outstanding 5 star ratings on popular review sites Trip Advisor and Netmums and has seen a large increase in visitor numbers. The Friends charity is currently one of three local organisations to have been selected to receive funding from Tesco’s Bags of Help scheme. The Friends’ project to create a ‘Woodland Learning Zone’ will receive either £8k, £10k or £12k depending on public vote which takes place in Musselburgh Tesco from 31st October to 13th November. 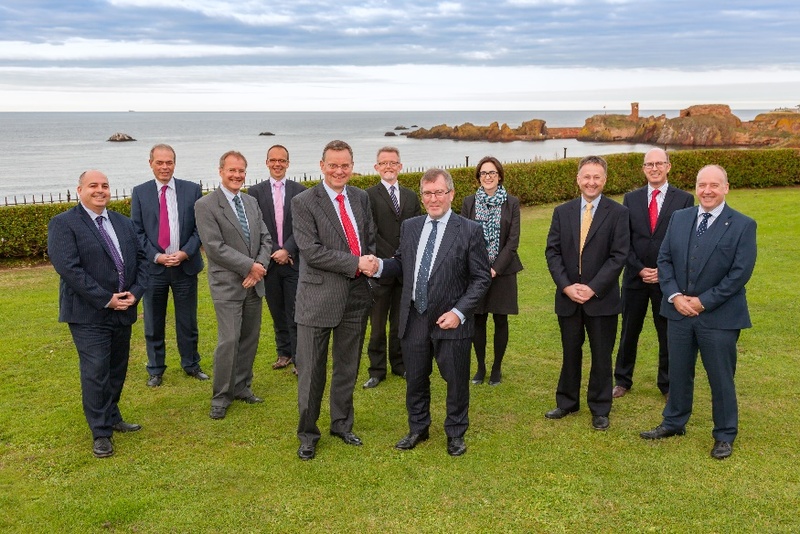 Haddington based chartered accountants, N C Campbell & Co, have merged with Berwick company Greaves West & Ayre. As of 1st October, the combined firm consists of 11 partners and 104 staff and will operate from fully staffed and managed offices in 8 St Ann’s Place, Sidegate, Haddington and Berwick-upon-Tweed. The expanded firm is called Greaves West & Ayre (incorporating N C Campbell & Co) and, with no changes to personnel, the usual contacts for both firms remain the same. The partners look forward to offering continued Quality Advice and Quality Service from the enlarged firm and invite anyone wishing to find out about the services on offer to get in touch for a free initial meeting.